After dinner I was washing the dishes and scrubbing a jelly jar as well as a spaghetti sauce mason jar to get the labels to come off. I was enjoying the heat of the steaming water splash over my hands as I rolled the jars from side to side and it brought a sweet memory to mind. I first started using mason jars as our drinking glasses at seminary. We had dinner at my friend Leslie’s house and when she poured a glass of milk for her husband into a mason jar, I thought to myself, “How cool!” Leslie was cool…long, flowing, silken black hair often under a black cowgirl hat with a stylish shirt and jeans accessorized with boots. Leslie oozed confidence. She knew what she liked and really wasn’t too concerned whether something she liked was the “in thing” or not. 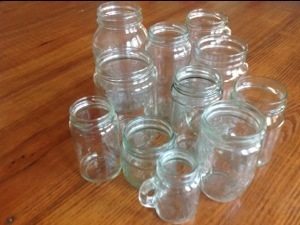 I purchased a flat of mason jars and began to drink my water, milk or juice with gusto. As the rimmed lip of the jar touched my mouth I was transported out of our 1,000 sq. ft. apartment into my own imaginary world. Some days I was on the prairie tending the homestead quenching my thirst as I wiped my brow while I took a break from the hot noon sun. Other days I was in a field of wildflowers sipping lemonade as I rested on a picnic blanket with David. And well, quite frankly, some days the noise and chaos in my home became the noise in the OK Corral of the wild west as I saddled up to the bar and wet my whistle. Who knew a simple jar could be so transforming, make me feel so alive? I realize many people use mason jars to have a drink. I no longer purchase my glass imagination transporters; I just recycle from my grocery store purchases. Jalapeño jars, jelly jars, spaghetti sauce jars, pickles jars, really as long as I like the shape and size, I keep it. For me now, it just seems practical. Why throw out a perfectly good, functional glass jar? Besides between the dishwasher and the human dishwashers in my house we break enough glasses that it just seems to fit the bottom line of our spending dollars. This entry was posted in Uncategorized and tagged dishwasher, mason jars, OK Corral. Bookmark the permalink. Being that today is Leslie’s birthday, how nice.